Which do you think is a bigger problem: indoor pollution or outdoor pollution? If you said outdoor pollution, slap yourself in the face because you lost and you deserve to be punished. If you said indoor pollution, go treat yourself to something nice. You deserve it, sweetie. It’s a common misconception that if we’re inside, we’re protected from pollution. Wrong. So, so wrong. The truth is that indoor air is five times as polluted as outdoor air. Pollutants which lurk within your indoor air include benzene, xylene, ammonia, formaldehyde, carbon monoxide, nitrogen dioxide and PM 2.5. Doesn’t sound too healthy, does it? Humans take between 17,000 and 23,000 breaths per day, and the average person spends 90% of their lives in doors. That’s a whole lot of polluted air we’re breathing. How are our houses so polluted? There are a few key contributors, including cigarette smoke, cleaning sprays and detergents, indoor cooking, indoor combustion (such as a fireplace), building materials, mold and even viruses brought in by outsiders. Indoor pollution might seem inescapable, but a good air purifier can do a great job of eliminating potential pollutants and irritants. Most air purifiers work by using specially designed filters to absorb all of the gross compounds that would otherwise be floating in and out of our lungs, but filters need to be changed, and typically aren’t very cheap. They’re also pretty gross to handle once they are loaded with pollutants. 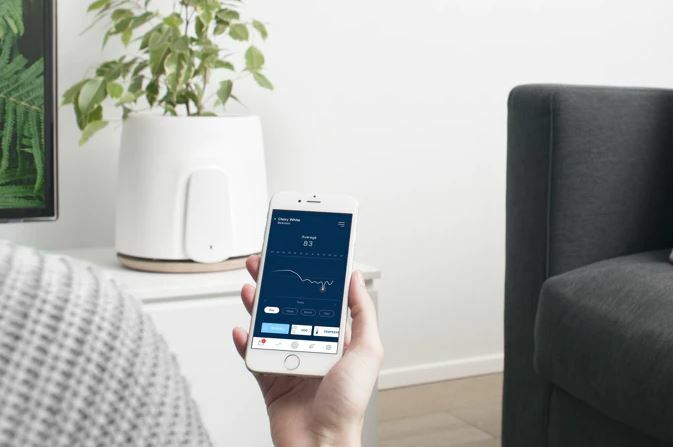 So we were pretty jazzed when we discovered the Natede, a smart device that fundamentally changes the way we think about home air purification. 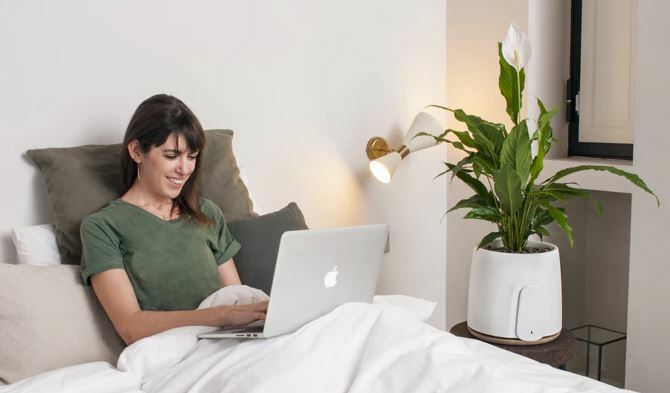 The Natede smart natural air purifier has taken Kickstarter by storm, raising nearly $700,000 despite a goal of only $58,940. Once we looked at its unique functionality, we understood why. The Natede takes filtered air purification and completely turns it on its head. 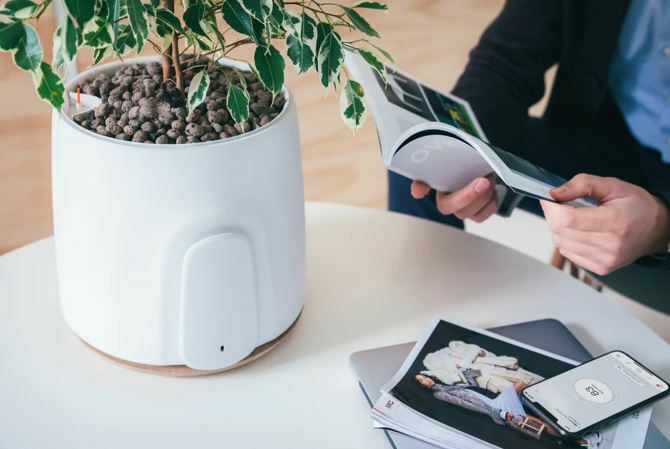 The device uses a technology called photocatalytic filtration, which utilizes the natural filtration process of plants and applies it to your home. Over the past few days we’ve tested out the Natede, seeing if it made a significant difference to our breathing and overall health. Here is our honest review. The Natede claims to be a smart device, and for good reason. The device features advanced sensors which help determine how to handle the purification process. 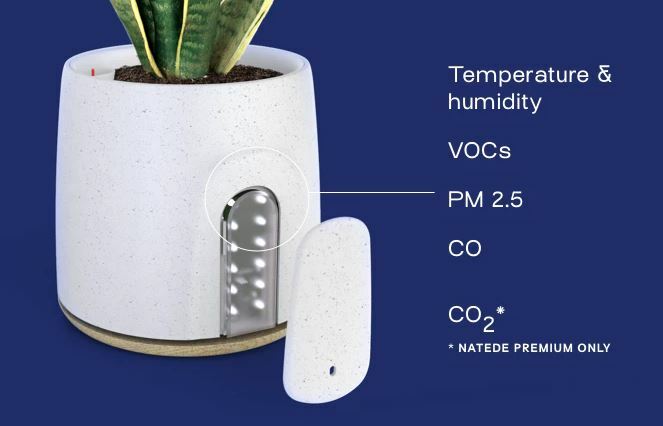 The sensors measure temperature, humidity, VOCs, PM2.5 (particle matter), CO and CO2 (CO2 is only monitored if you subscribe to Natede Premium). The purifier uses these sensors to monitor the air quality of your room, and adjusts to filter the air accordingly. These sensors help save energy and prolong the product life. In addition to the sensors, the Natede also features four different performance modes: auto mode automatically activates when the sensors sense poor air quality. Performance mode boosts the power of the device and keeps it pumping at full steam, which is great if you’re cooking with a gas stove or fear that you’re creating too many fumes. Night mode lowers the fan and dims the light when you’re not using them and custom mode allows you to decide your own preferred settings., including setting a time for the purifier to power on. For the most part we kept the device in auto mode. The device is very intelligent and uses its sensors well. The Natede is a natural reimagining of the home air purification process. In fact, it’s not only a reimagining, it’s a revolution; the next logical step. 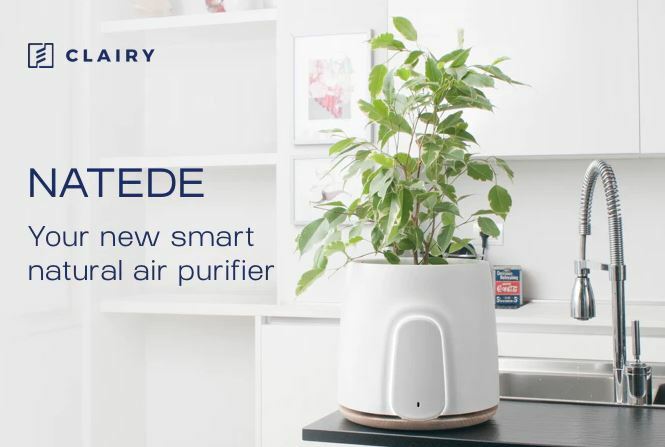 The core technology behind Natede is called phyoremediation, which is a fancy way of saying that it uses the natural power of common plants to purify your room’s air. The process was first introduced by NASA in the 1980s as part of their Clean Air Study. Using NASA’s findings as an inspiration, the Natede designers, Clairy, conducted three years of research using two of the most advanced neurobiology labs on the face of the Earth, PNAT and LINV. The Natede is the fruit of their labor. Most common plants have the ability to concentrate environmental compounds and metabolize their molecules in their tissues. Basically, this means that plants can use pollutants as food. Plants can also degrade and destroy the harmful effects of soil, water and air contaminants. The tricky part was being able to use the plants to target a specific area at a certain time. The natural purification process occurs when the polluted air from your room flows through the leaves of the plant, and is transmitted through the roots. So, why can’t we just get a few plants and place them strategically around our house? Sounds a lot cheaper to me! Well, there’s just one big problem. Normal flowerpots prevent air from reaching the roots. Natede is unique because it not only allows phyoremediation to occur, but actively promotes and amplifies it. The big question on our minds was how the heck they encouraged our indoor air to make its way into the plant’s roots. In regular flowerpots, air hits the plant’s leaves and deflects around the pots soil, preventing any air from reaching the roots. The Natede uses specially designed fans to direct air down through the plants leaves and towards the roots where the natural filtration can occur. Once the polluted air reaches the roots, phyromediation does the rest. After the air flows through the plant, it is redistributed into the air, emitted through the bottom of the pot. 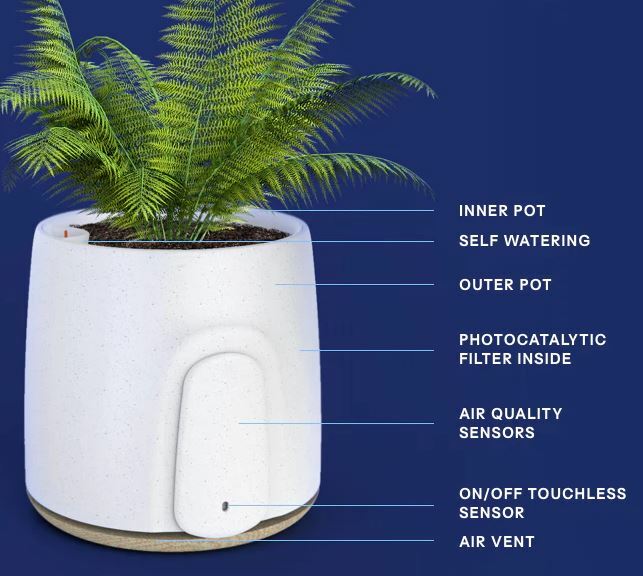 The unique design of the Natede allows plants placed within the device to metabolize a larger amount of pollutants when compared to that of a normal potted plant. In addition to phyromediation, the Natede also uses a process called photocatalysis, a process which uses light to help purify the air. The device ships with an included photocatalytic filter which absorbs the pollutants zapped inside by the charged light. The filter sort of looks like a circular sponge, or a piece of cut coral. Because of the filters design, air can still flow cleanly through, while it still absorbs all the pollutants that are left. The best part is that the filter never needs to be replaced. To clean the filter, you just throw it under your sink’s faucet and lets the water to the rest. Using a combination of phyromediation and photocatalysis, Natede claims to purify up to 93% of VOC pollutants, 99% of viruses and bacteria, and it even helps significantly reduce bad odors. The one caveat of using the Natede is that it has a smaller range and works slower than that of a traditional filtered air purifier. The Natede can purify a 129 sq. ft. room in 3 hours, or a 387 sq. ft. room in 9 hours. The benefit is that the purification process is conducted completely naturally, which takes some time. You need to let the plants do their job. If you’re using the Natede in an averaged sized bedroom, it’s a good idea to set it to automatically turn on a few hours before your normal bedtime. That way, the air is pure and ready to go by the time you crawl into bed. It’s not only the Natede’s advanced sensors that give the device its smarts. 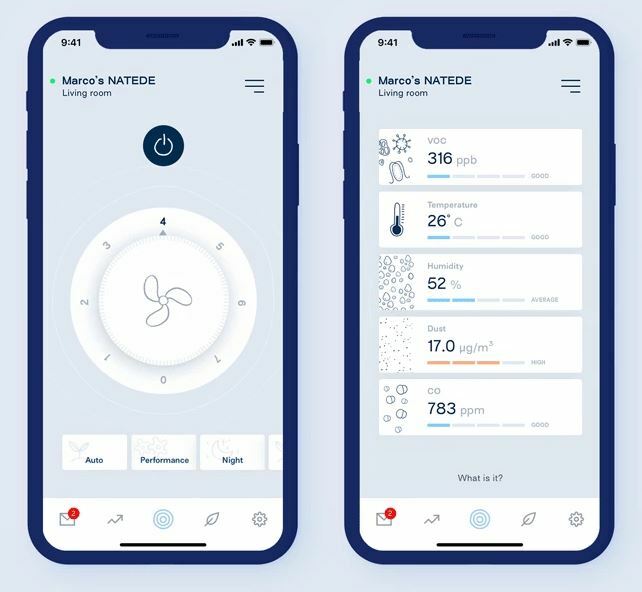 The Natede mobile app, available for both iOS and Android devices, allows you to actively monitor the air quality of your home. The great thing about the Natede is that it connects directly to your Wi-Fi, so it’s always connected. If you’re worried about any snags in the pairing process, don’t be. It also features Bluetooth, allowing you to easily complete the initial setup. The Natede app is really, really cool. There’s no other way to put it. When you first load the app, you are greeted by a dashboard which includes an overall air health rating, which Clairy calls the IAQ (Interal Air Quality). The IAQ tells you the real-time air quality of your space, including a numeric score and a description of the quality. The dashboard also features pulsating waves which change speeds depending on the overall air quality. From the main screen you can then get a detailed breakdown of the pollutants present in the air. In addition to air quality data, you can also control the speed of the Natede’s fan. What’s great about the app is that it lets you know whether or not you need the purifier working at full speed, so you can make a better decision about what fan mode to choose. Using the fan screen, you can choose between the four modes we mentioned earlier in the review: auto, performance, night and custom. Here is the killer feature. When Natede senses high levels of pollutants in your air, the app will automatically send you a warning notification, providing you with detailed information about the air quality. After each notification the app will ask for some basic information about your activity and will automatically adjust to fit your needs. We tested this feature out by placing our Natede next to the stove as we were frying up some burgers. We immediately received a notification warning us on possible pollutants. Absolutely amazing. Over the past week, we’ve noticed a drastic improvement in our breathing and overall health. While we admit that, to a point, we could be suffering from a bit of a placebo effect, there is no doubt in our mind that the Natede is doing its job and doing it well. The musty odor which once filled our room is now completely gone. In fact, we never even realized there was an odor until the room was free of it. Our breathing feels freer, if that makes any sense. We feel like we can breathe deeper and cleaner. We have a case of mild asthma, so sometimes we can wheeze if the air quality isn’t the cleanest. We didn’t experience a single asthmatic symptom since we have been using the Natede. This is a new kind of purifier. Forget about the purifiers which require you to purchase expensive filters. There’s no need for any additional expenses. The Natede is focused on one thing—making sure your air is always clean. If you want pure air, this device is an absolute must-buy.